There are many defenses to speeding tickets, some defenses are strange and unusual, some are common. Here is a list of some of the common defenses to speeding tickets. Most speeding cases rely on technology. In order to prove that a driver is guilty of speeding an officer must rely on a machine as the primary source of evidence. If a traffic attorney makes the proper legal challenges, an officer will be required to produce evidence that the speed measuring device was the correct make and model, was functioning properly and was calibrated recently. A traffic attorney should always verify that the evidence of calibration is in the proper format and challenge any format errors. Formatting and evidentiary issues are by far the most common ways for a traffic attorney to win a speeding case in Virginia. There are three basic types of speed measuring techniques or devices in Virginia: lidar, radar, and pacing. Each one has its strengths and weaknesses. 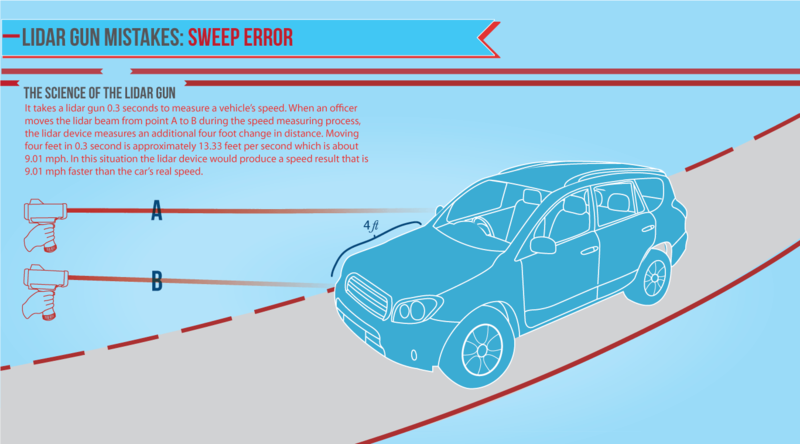 If properly challenged, a police officer may be required by a traffic court judge to produce evidence to prove he properly operated his device while measuring the defendant’s speed. For more information on technical defenses read the portion of this website dedicated to speed measuring devices. Contact a local traffic attorney if you think that your officer measured your speed incorrectly or if you would like to find out if you have a technical defense to your speeding ticket. If you want to challenge a speeding case it can be very helpful to have a speedometer calibration done on your car. Many cars’ speedometers are a few mph lower than they should be. This causes drivers to driver faster than they believe they are driving. A calibration certificate that shows a low speedometer can be used as mitigating evidence (evidence to lessen punishment rather than prove innocence). Also, if you are going to challenge a speeding ticket and want to testify that you were watching your speedometer and were never speeding, it is often necessary to have a speedometer calibration certificate to prove your speedometer was accurate. The most important factor in determining the punishment for a speeding case is often a driver’s DMV record. If you have an out-of-state license or if your police officer forgets to bring a copy of your driving record to court, you will need to provide the court with a copy. Unless you have a bad record it is usually beneficial to bring a copy of your record to court. A DMV record can be similar to a credit report. A DMV record can sometimes contain errors or surprises. It is good practice to get your DMV record well before trial so that you can spot errors and fix them before your court date. If you have traffic convictions on your DMV record, make sure your pending ticket will not exceed the maximum allowed demerit points. Consult a local attorney to discuss whether it is advisable for you to take a driver improvement course prior to trial. There are many different types of driver improvement courses. Sometimes taking a course before trial can help your case, other times it can hurt your case. Before trial and before taking any driver improvement courses, consult a local attorney. For more information about Virginia Driver Improvement Courses click here. 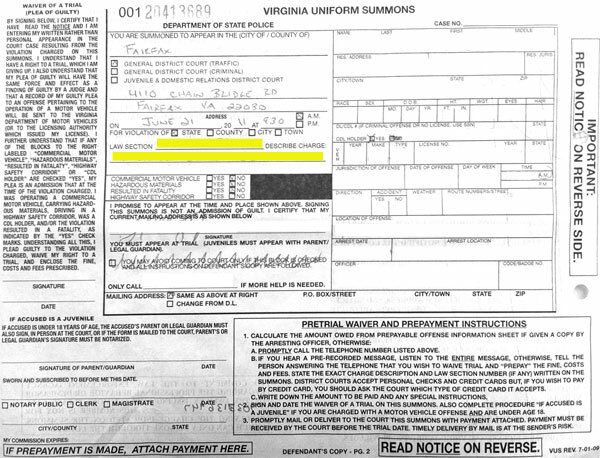 It is very uncommon for an officer to not appear in traffic court in Virginia. Unlike many other states, the typical practice in Virginia is for officers to be assigned one or two days a month to appear in court to prosecute all of their traffic tickets. Any time a court date is changed in General District Court, it is set to one of the officer’s future court dates. This means that if the officer does not appear in court, two to four weeks’ worth of work is lost. This can have negative repercussions on an officer’s career if it happens too often. If an officer does not show up to court and alerts the court in advance, some judges will continue the case at least one time to allow the officer a chance to appear (this is especially true if the absence is because of illness or family emergency). While having your officer not appear in court is a possibility, it only helps a small percentage of cases and getting multiple continuances usually does not help more than it hurts a defendant.